I have some black Adams board dollar tree foam now. 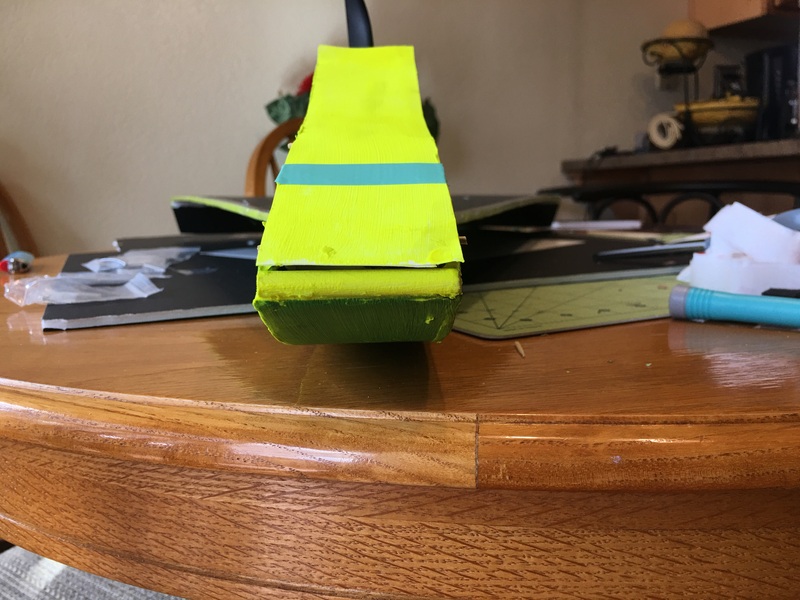 As I have a white wing and painted fuselage and other stuff on my trainer, I plan to have a black wing and cockpit decal on my slender delta, and the fuselage and vertical stabilizer will be another color. It's a tough choice because I've got ultramarine blue, fluorescent neon yellow, and a boatload of small tubes of metallic colors including blue, purple, orange, red, medium yellow, silver, and a couple other metal tones. Be careful with the metal color tones I was told they have aluminum in them and that can cause an issue with communication to the receiver. Really? Maybe to be safe I'll mount my antennas on the outside of my trainer because it has metallic green paint on the fuselage. Other than that, I can use it just on areas other than the fuselage from here on out. Update 2/11/19: Requested/started return process on faulty transmitter. I ordered a replacement, estimated to be here Wednesday. My Z bend tool is due any time from Friday to some time next week. I may attempt one build without this tool and see if I can do decent z bends with regular pliers. Other than that, I can do some work on paint and air frames and other stuff in the mean time. I usually do modified z-bends on my planes, they are a lot easier to do with regular pliers. Just what works for me . So I did some research. Most people who use metallic paint don't seem to have a problem. The only time it might make a bit of difference is if the area that encloses the antenna is painted on all sides. Even so, I have heard statements from people who have used it for years on fully enclosed antennas and no issues. Most people who use metallic paint don't seem to have a problem. I can't make any guarantees but everything should be fine. There's ways to get technical and measure if it interferes, but the easy rule of thumb is, if you do a range check and it works, you should be good to go. Working on my "pride and joy" today while I wait for stuff to come in. I have decided on neon yellow for a secondary color. New transmitter boots up, seller of the old one is being annoying and requesting some sort of video to find a solution. What could they possibly need from a video and what solution? It's defective out of the box. I may just have EBay settle it. Also, word of caution on my poster board firewalls-the glue and FB dust will dirty your drill bits. They are easy to scrape off, I may try a little rubbing alcohol and an old toothbrush. I was able to modify FT swappable firewalls as well, but it was difficult to make it fit on the mini kits. Still curious as to how the firewalls will hold on flight with the motor heating up and putting a force on it?! Waiting for your feedback . I'll know when I maiden the custom trainer. That's the only one I'll be using the home made firewall on. I have my new transmitter now so I have to finish putting together and setting up my first three planes. The custom trainer needs linkages and a top hatch and a receiver. My scout needs a bit of work on the fuselage, paint, linkages,and electronics. My slender delta needs electronics and linkages. One thing I'm a bit worried about on my slender delta is that the wing is a little bit warped. Somehow my black Adams board I bought was all slightly warped and that was the best piece. I'm not sure if it was that was out of the store, or because I left the stack of 8 sheets leaned up against the back seat of a car in the trunk for a few hours. It has a very slight anhedral similar to a concord wing that's a tiny bit uneven. I dropped the wing and it glides straight down like a parachute without rolling so can't be too bad. I should have paid more attention because I'm trying to figure out if it was that way from the store or if a couple hours of leaning could distort it. I'll take a pic when the wing is fixed into place properly. Yea, I tend to cherry pick the local stock... a quick tip, as your checking out the boards grab about half and rotate them 180 degrees. the look at the gap (on edge) as you compare them (it'll help you notice if the whole stack is warped the same...) or pick out the best/worst ones. Yeah I'm kicking myself because I'm pretty sure I checked and they were good out of the store. Must have been that few hours of leaning against a car seat. I really hope my plane will still fly and be stable. Doesn't look too bad because it's mostly a slight anhedral, but it's a bit uneven I'll have pics soon when the wing is mounted. There is a way to improve the wing strength and remove warps. Where needed I cut a slot or two in the underside of the wing, (spanwise the same on both wings). I then apply glue to the slots and force in thin CF strips. Then I place the wing on a flat surface, (the floor? ), with some cling film covering the glue side and apply weight to hold it flat against the level surface until the glue is set/dry. (I use an old wooden stair tread). When dry the wing is flat! I then seal it with minwax or similar to keep the water out and it is free to use/fly! I would have to buy some carbon fiber. I'm really just hoping the slight warp doesn't make much of a difference otherwise I think I'll just rebuild the air frame. I'll try to get a good picture of the warp. It's more an anhedral than anything. The concords wing is like this on purpose. The very back is not warped that's just the elevons dropping with no linkages. The very back is not warped that's just the elevons dropping with no linkages. For a second there I thought "That's going to nose right in!" but then realized that was the elevons!